Bengaluru FC became the new ISL champions as an extra-time header from Rahul Bheke helped the table-toppers pip FC Goa in the 2018-19 season ISL final. This is also Bengaluru FC's first silverware under new coach Carles Cuadrat after having won the I-League twice, Federation Cup twice, and Super Cup once under previous coaches Ashley Westwood and Albert Roca. Bengaluru FC fielded an unchanged side that defeated Northeast United FC 3-0 in the second leg of the Hero ISL semi-final whereas Sergio Lobera made one change to the FC Goa side that lost 1-0 to Mumbai City FC in their second leg. He took off Hugo Boumous and brought in Edu Garcia in the attacking midfielder role. However, it paid no dividends as the Gaurs couldn't register a single goal. At the end of the day, the match was a tightly contested affair with individual battles deciding the fate of the outcome. Without any further ado, here are five hits and flops from the ISL final match between Bengaluru FC and FC Goa. FC Goa went into the game with a four-day break and Bengaluru FC with a five-day one. Given the ample time they had, both the teams did their homework and, it led to a blunt first half. However, Jackichand Singh created constant menace in the right wing and had Nishu Kumar in his toes. 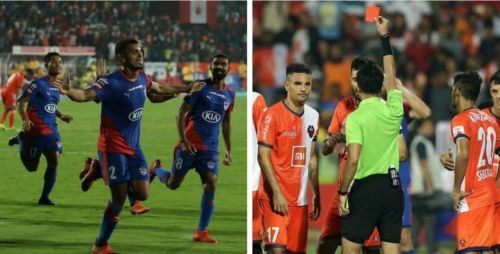 The best chance to FC Goa fell in the 14th minute of the game when Jackichand Singh left his marker Nishu Kumar for dead and pumped in a cross to Ferran Corominas in the far post. However, the Spaniard couldn't keep his first-time shot on target and, the ball went away for a goal-kick. Even the first shot on target of the game from FC Goa came through his trickery down the wing. He dispossessed Dimas Delgado in the midfield and went to the edge of the box before cutting it to Ahmed Jahouh. As the game progressed, Jackichand Singh grew tired for all the hard work he had put in. Finally taken off in the 110th minute and received a standing ovation from the FC Goa fans.